Pallet bands are an environmentally friendly way to stabilise pallet loads when moving between locations within the same unit. They are re-usable, dispense with 'one time use' pallet wrap and are available in 3 sizes to meet your pallet requirements. 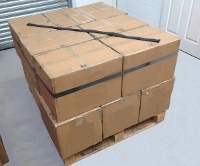 BluePallet Band - 450 x 25mm - Latex free and food quality - Non marking UV..
Green Pallet Band - 450 x 50mm - Latex free and food quality - Non marking ..
500 x 15mm Pallet band ..
600 x 15mm Pallet band ..
600 x 25mm Pallet band ..
900 x 25mm Pallet band ..
900 x 40mm Pallet band ..
1200 x 25mm Pallet band ..
1200 x 40mm Pallet band ..
activaBand stretchband (100 ROLL) pallet stabilising 100mm x 1200mm Ideal for s..